My name is Sheryl, born in Kent U.K. and now living in Gijon on the north coast of Spain. I have a son who lives nearby and a daughter and three grandchildren who live in Madrid. I retired from ESL teaching last year. I remember learning embroidery stitches and making a samper while still at Primary School and my mum taught me how to knit, crochet and sew. 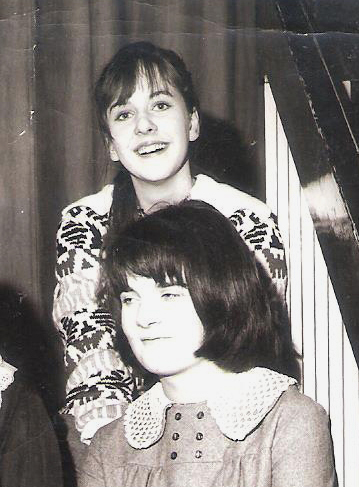 I must have been a super boring kid as I can remember taking my knitting to school and in the photo below I´m sporting my first Fair Isle sweater made when I was 15. I started my blog three years ago with the idea of just creating a permanent record of my needlework as other girlfriends were doing but I got caught up with the fun of meeting and chatting to other crafters about our shared hobby, seeing what they were making and enjoying the wonderful tutorials and SALs available. 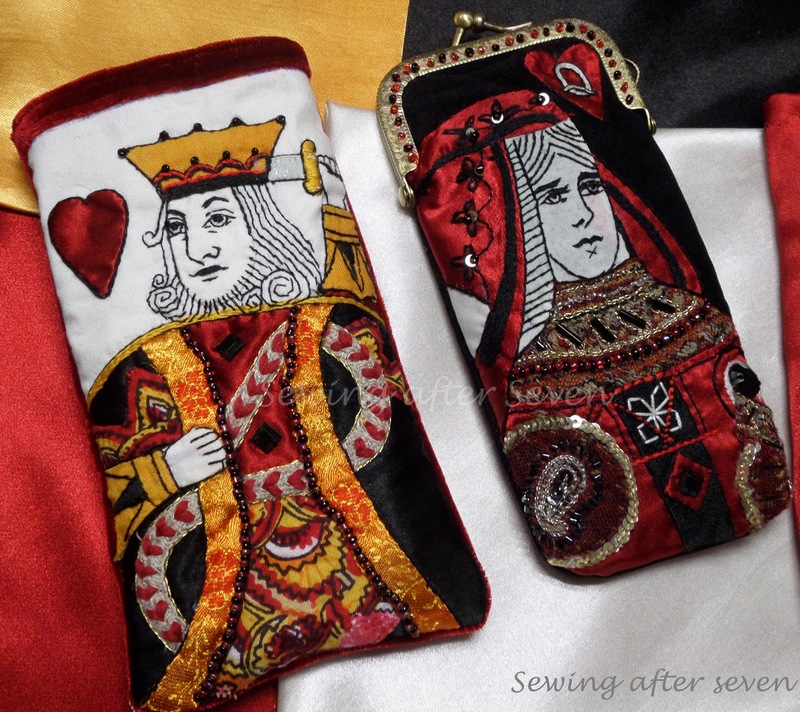 I pondered about my blog name for ages endevouring to conjure up something ingenious and memorable but everyone had got there before me and so I opted for `Sewing After Seven´ which is when I do most of my stitching. Organised and eclectic. I jump from one technique to another as I´m interested in everything fashioned with a needle, whether hardanger, whitework, crochet, applique, knitting or patchwork. I always have two projects in the making, embroidery which I do in the evening and sewing at any other free moment during the day. I very rarely work on a pattern without knowing what I´m going to use it for and have a dangerous tendency to adulterate patterns and change them to add my own touch of beads, lace, applique, crochet or somesuch with the sometimes disastrous consequences that result from such deviations from the original and result in the entire project being abandoned and banished to the Dreaded Drawer aka UFO cemetery. No favourite designer. I love embroidery in general but Hardanger, whitework, reticella and schwalm embroidery always draw my attention, as with samplers including speciality stitches and crazy quilting stitches and stumpwork. Also I love fine crochet work. A quilt I made for a grandson and based on the illustrations by Petra Steinmeyer in the story book The Bremen Town Musicians. I felt very proud when Petra complimented me on my work and asked for more photos of the said quilt. Not exactly mine but while attending patchwork classes years ago, I was making a cushion cover when the teacher said my little applique houses needed windows and doors but not to bother with embroidering the tiny details as they could be done with a permanent marker pen which she then procured from out of nowhere and proceeded to draw on my cushion making what I considered a horrible mess. Although the cushion is very old and faded you can still appreciate the disaster in the photo. Definitely whitework, reticella or schwalm embroidery which would make a nice challenge or bobbin lace making. I also need to learn free motion quilting. The aformentioned Dreaded Drawer contains mainly completed patterns which for some reason or another lost favour during their execution and where a lot of the considered substandard experiments have ended up. Sometimes I look at that drawer and rescue something like the tiny design below which when stitched a couple of years ago I found annoyingly unsymmetric but which just this summer I made into a pincushion that I now really like. I don´t have a favourite way of finishing a project but prefer to make a design or pattern into something original or useful and not just framed. Perhaps my little embroidered pouches. I love working with rich fabrics, velvets, silks and satins etc, and mixing applique with speciality stitches and a splash of beads, sequins etc. perfect. It taken me a week to think about this question and I still can´t think of anything intriguing. But rather curious, I suppose, both my children were born the same month, the same date and the same day of the week although born five years apart. I have found that the stitching community is very friendly and if you are stuck with a particular project or technique, there is always someone to ask or a tutorial to follow. 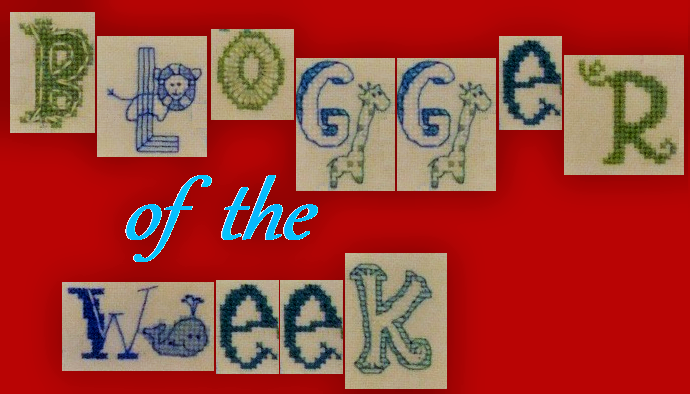 I´m grateful to Jo for including me as a Blogger of the Week and to those who visit my blog and take the time to leave a comment. Your work is incredible. I have an almost identical story with my children! They are a day apart though but both born on a Thursday and with times ending in 48 mins! Glad to meet you. Your work is beautiful! Although I have been following your blog for some time it was lovely to learn more about you and the stitching you love! Yay, hi, Sheryl~ :D I know your blog and I think your other amazing talent is taking splendid photos of your projects! I don't remember seeing all of your hardanger pieces before. Love "LOVE", that's beautiful work. Hello Sheryl. I have thoroughly enjoyed reading about your lovely crafting.Your grandson’s quilt is amazing and I love your passion for so many different techniques. Like Rosie I really like the "Love" piece, it's exquisite. I can't believe you were such a talented knitter at 15! That's a lovely photo of you modelling it too. You are very talented Sheryl, such a lot of beautiful things you have shared here. I have been following your blog for a long time now and I always love to see new posts from you. Your work is so full of creativity, you're such a talented needleworker. Nice to learn a bit more about you through this interview. I have been enjoying reading your blog for some time now but still it was great to read some more details about you!AriadnefromGreece! So enjoyed reading about you, Sheryl! I had no idea you were a retired ESL teacher! The variety and detail in your beautiful needlework always amazes me--you are a true needlework artist!